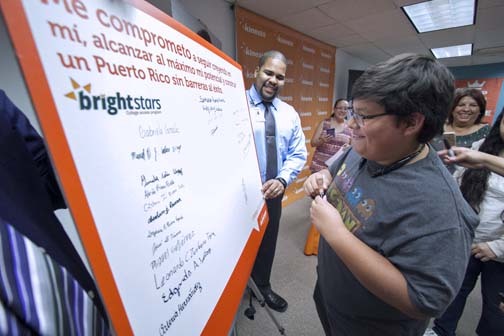 The call, which is part of an alliance between both educational institutions, is aimed at qualified undergraduate students from Puerto Rico. With the aim of being part of the recovery process of university students in Puerto Rico following Hurricane María, the Kinesis Foundation is joining the Georgia Institute of Technology (Georgia Tech) to provide Puerto Rican students the chance to pursue a semester at the stateside university. As part of the effort, the Kinesis Foundation will serve as a point of contact and pre-selection of interested students. The process will consist of the Foundation Candidate Analysis Committee evaluating the applications received and interviewing the selected students. Kinesis will then send the Georgia Tech staff the information of the pre-selected candidates for the final selection. University students who receive notification of acceptance may attend the institution only during the spring semester 2018 (January to May) as a visiting student. There may be financial aid available for students who qualify. It will not be necessary for the student to have taken the SAT. The credits obtained during the semester of studies in Georgia Tech will be conducive to the degree based upon information provided by the home institution and the student. The credits earned will serve to fulfill the requirements of graduation in the university institution of the student as determined by that institution. At the end of the semester, Georgia Tech will have a transcript of approved credits available for the student to deliver at the home university. To submit the application, students must access: www.kinesispr.org. The deadline is Nov. 30 and no applications will be received after that date. Hey Buddy!, I found this information for you: "Kinesis Foundation provides chance to study semester at Georgia Tech". Here is the website link: https://newsismybusiness.com/foundation-provides-semester/. Thank you.